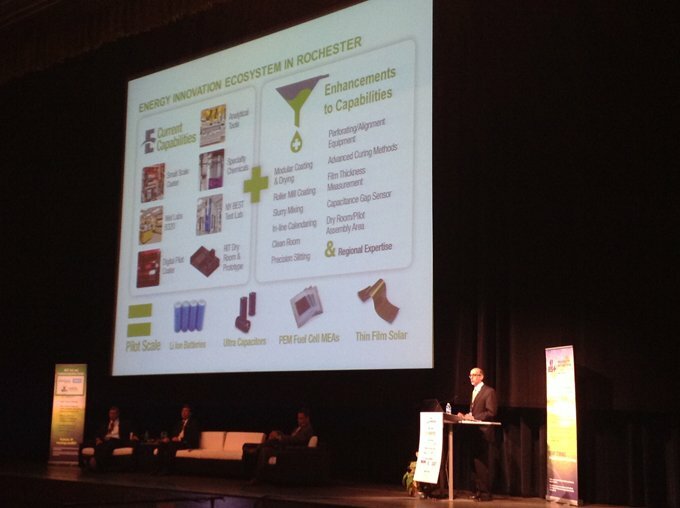 At an alternative energy manufacturing summit recently at Eastman Business Park, more than 120 scientists, technology experts, corporate executives and government leaders gathered to discuss new market opportunities for suppliers, manufacturers and entrepreneurs in the rapidly growing advanced battery and energy storage technologies industry. Attendees to The Energy Storage Supply Chain and Manufacturing Conference and Expo, hosted by the New York Battery and Energy Storage Technology (NY-BEST) consortium, heard industry experts talk about the broad economic potential for energy storage technologies, applications and markets, the scope of the supply chain opportunities, and insights on how to capitalize on those prospects. 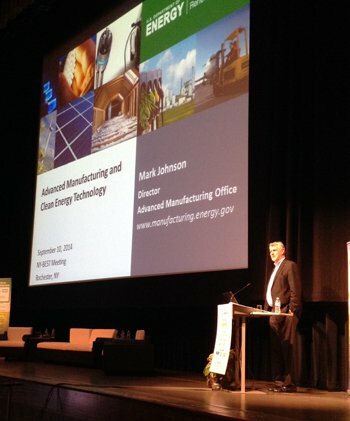 Dr. Mark Johnson, Director of the Advanced Manufacturing Office (AMO) of the U. S. Department of Energy's Office of Energy Efficiency and Renewable Energy, delivered the conference keynote. He discussed the AMO's interest in using public-private partnerships to leverage the nation's unique manufacturing assets like those at Eastman Business Park. Such a scenario, he said, would help create a fertile innovation environment for vigorous domestic development of new energy-efficient products and manufacturing processes. Sam Jaffe underscored Dr. Johnson's remarks with an upbeat market assessment for battery manufacturers and allied businesses. A research analyst for Navigant Research, which studies trends in the global clean technology markets, Jaffe said demand for advanced battery systems as an alternative means to power vehicles, grid management equipment and consumer devices will continue to expand in multiple industries around the world for the foreseeable future. Navigant's industry projections also bode well for Eastman Business Park and its growing cadre of tenants in the battery and energy storage sector. “That equipment, combined with the know-how to develop and operate these processes, already exists at EBP," he said. “The result is that next generation clean and alternative energy products can be brought to market much more quickly and economically." Alt said that helps explain why high tech energy–related companies and universities from around the world are converging at EBP to create prototypes for new energy storage and delivery systems, test them, do pilot manufacturing – and then get business assistance to take those products to market. “We expect that thousands of jobs will be created in the battery and energy storage industry in the next decade," said William Acker, Executive Director NY-BEST, who together with global energy technology giant DNV-GL recently opened a testing and validation center for next generation energy storage devices at EBP. “With a long history of innovation and entrepreneurship, a highly educated and skilled workforce, major energy markets and a strong manufacturing infrastructure at Eastman Business Park, New York is uniquely qualified to lead the industry," he said.